Polyonics barcode labels include specially formulated topcoat chemistries that resist highly active fluxes and high pressure washes plus resist abrasion from contact during processing. Polyonics XF-731 label resist ORX1 highly active fluxes. Shown post reflow process. Polyonics continues to provide the most durable PCB barcode label materials for use with the latest highly active ORX1 fluxes. Polyonics remains at the forefront of durable barcode label material design. The Polyonics polyimide label materials continue to set the industry standards for tracking PCBs though their high temperature and harsh environment manufacturing processes. The materials are uniquely formulated to resist highly active ORH1 fluxes, remain affixed to products post high pressure washes and not soften or smear if contacted during the reflow or wave solder processes. 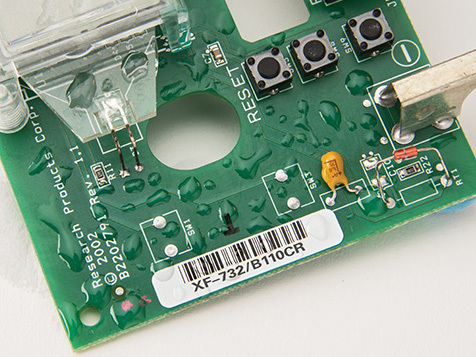 Highly active (ORH1), water based, no-clean fluxes are the standard in PCB manufacturing. Because these new fluxes are sprayed, brushed or dipped they tend to pool on the surfaces of the PCB and labels. When the fluxes are then exposed to heat, they can cause significant damage to standard label materials by dissolving top coats, degrading printed barcode images and/or causing adhesive failures. Many of the smaller PCBs now need to be mechanically secured during reflow and wave solder with clips or fixtures. This raises the risk of the barcode labels being contacted directly by the holding device potentially causing damage to the top coat and subsequently the barcode image. 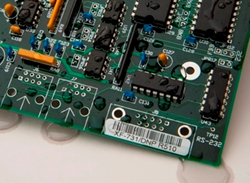 In addition, when a cleaning process is required that entails high pressure washes, if the appropriate PSA is not being used, the bond between the barcode label and PCB can be further impaired. Polyonics has developed ultra-durable top coat chemistries that are resistant to the harshest fluxes in the industry including ORH1. These ultra-durable topcoats can resist softening, will not yellow at elevated temperatures plus exhibit excellent abrasion resistance when directly contacted during the manufacturing process. In addition, Polyonics has developed a family of ultra-strong pressure sensitive adhesives (PSA) that resist high pressure washes including hurricane and coherent wash processes. The XF-731 (1 mil) and XF-732 (2 mil) are thermal transfer printable polyimide label materials that include Polyonics latest ultra-durable semi-gloss white topcoats. They also include aggressive one and two mil acrylic pressure sensitive adhesive systems and are designed specifically to provide barcode tracking of printed circuit boards and electronic components through the harshest of PCB manufacturing processes. The application profile PCB Tracking with Barcodes describes the variety of PCB label materials available from Polyonics. For more information please contact Dave Genest at dave(dot)genest(at)polyonics(dot)com or 603.352.1415. Polyonics manufactures high performance materials for high temperatures and harsh environments. These include thermal transfer printable label and tag materials, single and double coated tapes, laser markable label materials and printable flexible substrates. The ultra-thin materials include flame retardant, ESD Safe™ and high opacity options and are used by converters and OEMs worldwide for electronics, automotive, metal processing, aerospace and medical device applications.